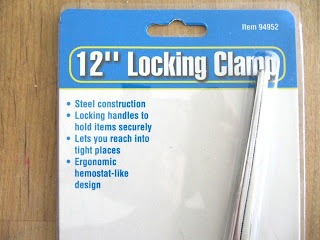 Well, I found one more...a locking clamp. I found this in Harbor Freight Tools for $3.99. It's used to hold things securely and reach into tight places. Probably for clamping hoses on motors or something. 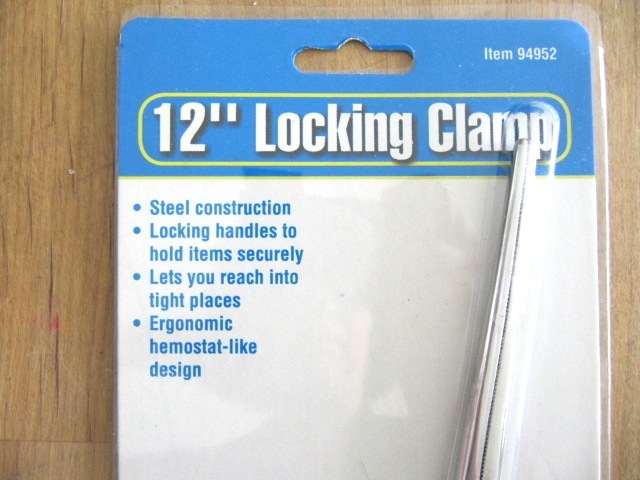 We also have locking clamps in the dental office where I work. They are called hemostats...much smaller though. Hmmm...need to ask my boss if I can have one. Add to my collection. LOL!! The handle is like a scissor handle, but has a ratcheting locking system that locks the tip to hold something. Here's a picture of the tip or nose of the clamp. Now onto the "Sewing" transformation of this tool... TURNING A FABRIC TUBE. When you sew a fabric tube for handles on bags or anything long and narrow, boy can it be a pain turning it right side out. 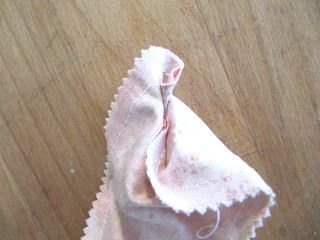 Just insert the clamp nose into the narrow fabric tube until you reach the end. 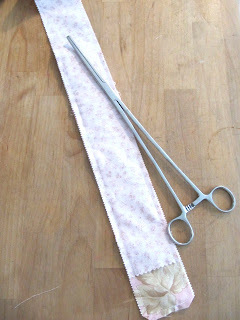 grab a little of the end fabric and lock the clamp. Pull back on the "locked in" fabric and pull through the tube. I am not kidding with this...it is fabulous!! Fastest turning for me...ever. You really need to get one. I have no affiliation with Harbor Freight, but it is a great store. I'm sure you can find this online or in an automotive store if you don't have Harbor Freight. I'm so mad, the one Harbor Freight sells on their website has cute bright red handles :( Would have match my sewing room. Wow..what a great tool. MUST. FIND. ONE!!! You are my newest hero! This is a fabulous idea! LOVE IT! what a great tool! husband is a fly fisherman, ties his own flies we have a stack of them and never thought to snag one. dibs on one now! i wanted to tell you how much i appreciate all the hard work you put into your blog. Am now going to hunt high and low for one of these, first stop ebay!! I have had one of these for a few years and I love it. I originally bought it back when I used to do garment sewing and it was so great for turning facings and collars and tubes. I still use it a lot (just did tonight, in fact). I don't have a Harbor Freight but there is a local flea market that comes once a year and I bought mine there for a whole dollar. 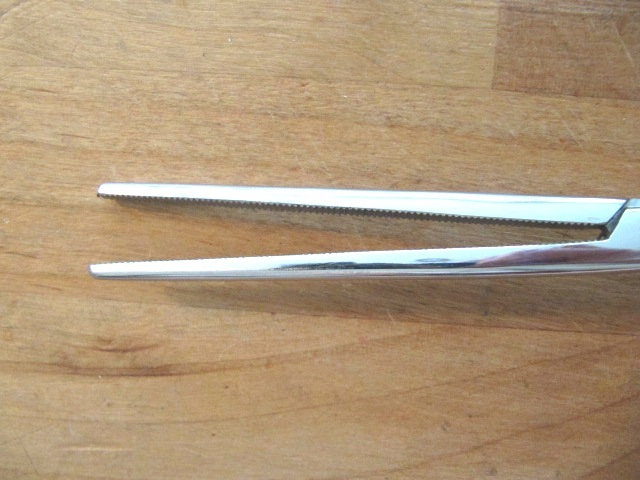 I also bought these reverse tweezers that are invaluable. This is one of my favorite tools in the studio. I got mine in a retreat package a couple of years ago to work on a specific quilt pattern. 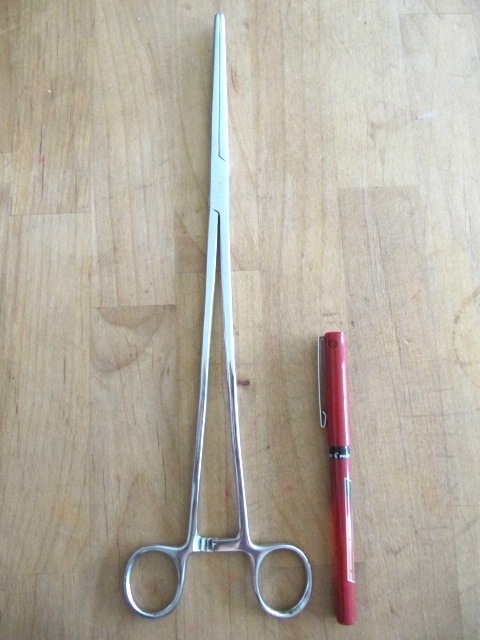 I think mine actually is a hemostat but same principle. With this and a "Purple Thang", I can turn and push out nice points on just about anything. I had many pairs of hemostats from my nursing career, and I use them for quilting stuff all the time. But, the long ones will be great!! Need to make a run to Harbor Freight, I love that place. I think of you every time I go there, lol. 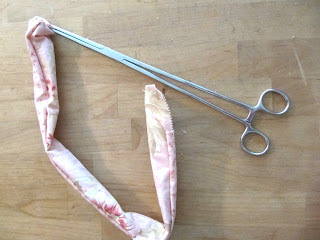 I've used hemostats for years, especially back when I made mohair bears. They work great for turning small teddy arms and legs, but also for stuffing. Grab a little bit of polyfill with the tip of the clamping tool and fill a muzzle area in no time. 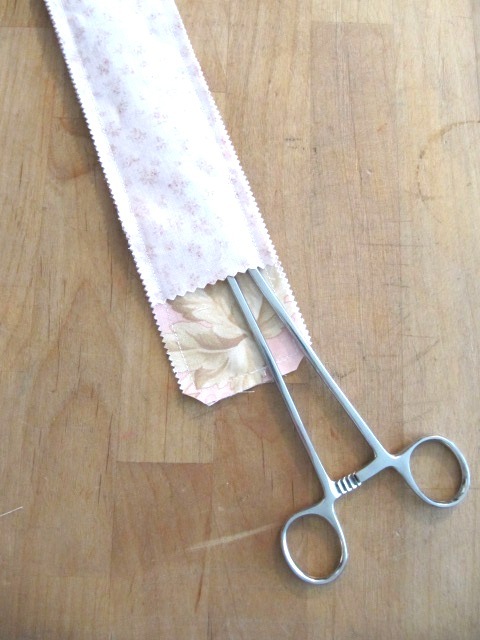 Would work great, too, for stuffing a pincushion. If you don't have a Harbor Freight store, I've seen them at quilt shows at the scissor vendors table- lots and lots of different sizes! Love your Tool Time Tuesday! Thanks for all of the great ideas. I have sewed with a pair of hemostats for at least 10 years, but these long ones look even better! 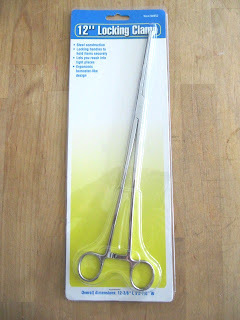 Three nurses in this family....we like hemostats! I keep them at assorted places in the home for so many wonderful uses, including next to the sewing machine! Great tool. Love it ! And I imagine after you turn the fabric out, you could put the 'tool' back inside, open it wide and use that to spread the fabric smooth while finger pressing in place. Great post, as always ! Oh I'm going there to get one! I asked a friend of mine that is a EMT if they had any extra hemostat's once LOL Me and hubby go to Harbor Freight often so putting it on my list! (just never thought to look for that ) Thank you , you always have nice tips and tricks! You can also get hemostats at Walmart in the fishing section. Plus they carry the curved tip ones as well as the straight ones. Curved ones can be easier to use for making stuffed animals where body parts have a curve, not only to turn right side out, but place a bit of poly stuffing and clamp in the curved tip and then you can stuff those small hard to reach places like fingers and toes. The ones Walmart sells might not be as long as the ones you have Karen, but they can still do the job most of the time. Awesome idea! This must be pinned!!! Awesome! I definitely need one of these! I have a shorter one, but NEED the long one, LOL! My latest "favorite" is an angled (sometimes they are called "offset") screwdriver. It is AMAZING to be able to easily remove/replace the screws in my machine plate. OMG! I am so going to get one of those! 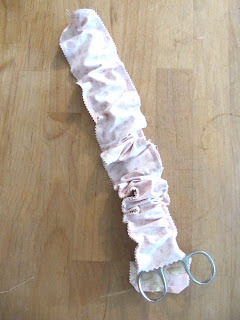 I have been making aprons for the famiy and friends and it will be so much easier to turn the straps! Thank you for the great idea! Holy Cow! At first when I saw this I thought to myself...OK? Now what in the world would I do with something like that? But as I continued to read...using the pictures....I soon realized...I most certainly need one of these. Who knew? Man my hubby goes to Harbor Freight all the time. They do have a wealth of items that a crafter can use. And it is usually so much less expensive than the craft stores sale it for. ;) Thanks so much for the tip! 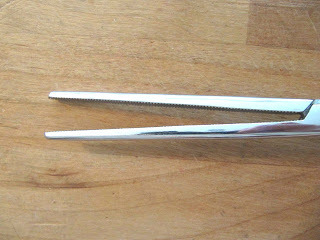 They work really well for turning but they're also really useful for stuffing, especially stuffing small things. I've made several cloth dolls that are 3-5" and use clamps to get the stuffing into the ends of arms and legs as well as just that one place it needs to be to smooth out the head. 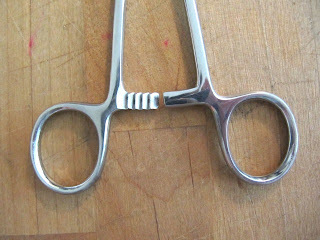 When i worked in a hospital, nursing, many moons ago, and things like hemostats weren't inventoried or disposable like now, I "borrowed" a pair of these and still have them. The shorter kind. This is a terrific idea even for the shorter ones. Thanks for sharing. I used a version of a Fasturn turning kit growing up when my grandmother and I made a bunch (and I mean a BUNCH) of fabric hair ties. Interesting to see how this compares. 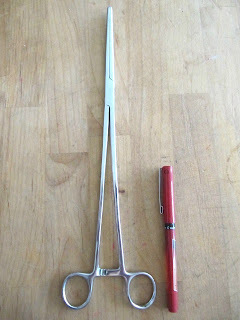 I have the shorter version hemostats but a LONG pair is just the ticket for turning long tubes! Thanks for the tip and I can't wait to go to Harbor Freight! You amaze me with the great ideas you come up with! Thanks for the tip which will sure help out when turning those dreadful tubes. I am going to get me one of these and I pinned your idea too! Thanks!! What a great idea. I have to see if my DH has one of these in his shop I can liberate. If not, then I am off to Harbor Freight. Brilliant!! Thanks so much; I just ordered two! OH MY GOODNESS I GOTTA have one of those! I have another thing but it's not that long but it works pretty good. SOMEONE PLEASE HELP ME!! 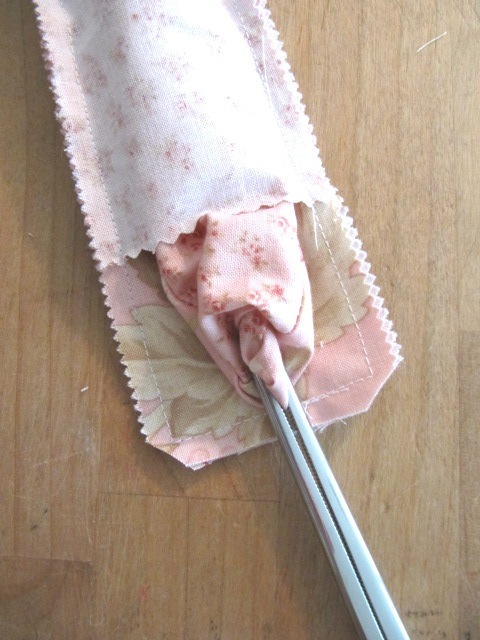 HOW DO I SEW A FABRIC TUBE?? ?